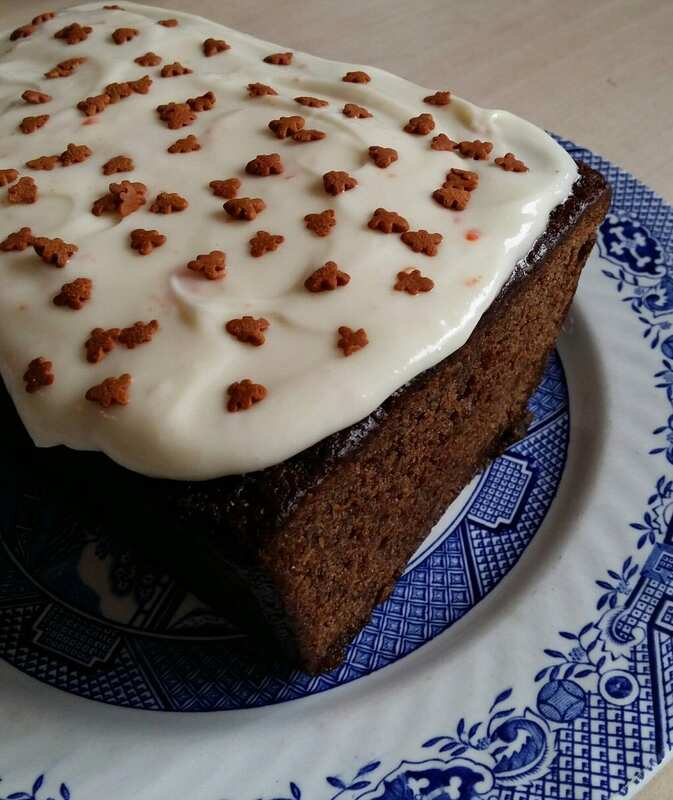 I really do love a nice, sticky gingerbread loaf cake. There’s just something so comforting and old fashioned about it. And personally, I can’t think of any other bake that goes better with a cup of tea! Like most gingerbread, this is best made in advance – keep it wrapped (uniced) for up for 2-3 days and you’ll be rewarded with a beautifully sticky, moist ginger cake. Treacle and golden syrup is the secret to making the best gingerbread – as well as a generous amount of ground ginger and some chopped crystallised ginger for an extra kick of flavour! I go through so much treacle in the Winter months I’m actually considering buying it in bulk. As well as making gingerbread, I use it to make these spiced ginger cookies, treacle scones (recipe coming soon!) and I swirl it through my porridge. You can leave the gingerbread plain if you wish by all means – but adding either a fresh, zingy lemon icing or a tangy orange cream cheese icing really takes this cake to a new level. I love both options, so I tend to go for whatever takes my fancy at the time. If I choose the lemon icing, I like to decorate the top with chopped crystallised ginger. Lemon and ginger complement each other perfectly! This is an updated post with new photographs. Originally posted January 2014. Disclosure – this post contains affiliate links, which means that I will earn a small amount of commission (at NO extra cost to you) if you decide to purchase the items advertised, which in turn enables me to bring you all these recipes for free. I only recommend products I use myself and love. Thank you! This moist and sticky gingerbread loaf cake is dark, fragrant and only gets better after a few days - that's if there's any left! Preheat the oven to 180C/350F/Gas Mark 4.Grease and line a 2lb loaf tin. Sift the flour, bicarbonate of soda, spices and lemon zest together in a large bowl. Rub in the butter until the mixture resembles fine breadcrumbs. Stir in the lemon zest, sugar and chopped crystallised ginger. In a small pan over a low heat, melt the treacle, syrup and milk. Remove from the heat and let it cool to room temperature before stirring in the egg. Pour into the flour mixture, whisking thoroughly until no lumps remain and you have a smooth batter. Pour this batter into the lined tin and bake for 55-65 minutes or until a skewer inserted into the middle comes out clean. Let the gingerbread cool completely in the tin. Sift the icing sugar into a medium sized bowl. Add enough lemon juice to make a thick but pourable icing. Pour over the cold cake and top with the remaining crystallised ginger, if using. Beat the cream cheese, butter, orange zest and vanilla extract together until creamy. Beat in the icing sugar until smooth. Spread over the top of the cake. If you ice the gingerbread with the cream cheese icing, you'll need to leave the cake in the fridge. The icing will be good for up to 2 days. Mmmm… the icing sounds incredible! Thanks! The icing really does add something extra ? Oh my goodness, I want to eat this right now! Me too! I may make another one tomorrow ? Nice combination of gingerbread with a cream cheese frosting. I can imagine that the orange really adds a nice zing. Wish I had a slice of this! The orange goes really well with the gingerbread. I could eat a slice right now for breakfast! This reminds me of desserts on a Sunday when I was younger. It looks delicious and the wee gingerbread men on top are so cute!